A platform for interested residents to raise concerns and progress our community. A co-ordination and communication vehicle for Warrimoo based groups. Free Rickard Rd. Tennis Court Usage over both Weekends!! 11.30am—1.00pm—‘Welcome to Country’ Ceremony—Darug man Chris Tobin to lead off the special School Assembly—Special School Assembly devoted to Warrimoo Centenary—classes do their presentations; assignments arranged around Hall interior; ‘Emu Dance’; all residents invited. 7.00pm—‘Taste-Test Launch of Warrimoo Pizza’—a quest to find the essential ‘Warrimoo Pizza’, upstairs at Monte Italia. Attendance by reservation— Please call 47536385. Click through for an historical image of a group of hikers descending a winding road, Valley Heights(Part of Fairfax archives). For a while it looked like Warrimoo would lose another piece of infrastructure: the Bus Shelter next to the ‘Whimsical Notions’ antiques shop was threatened with removal. As soon as Sue from the ‘Blue Shop’ heard she contacted the Warrimoo Citizens Association—a few panicky phone calls later BMCC Mayor Mark Greenhill had interceded and halted the proposed removal to allow further consultation. Various stakeholders, including WCA, attended an ‘on-site’ consultation with the relevant Council Officer (Mark Bruhn) and discussed alternatives to removal of the existing Bus Shelter. It was pointed out that the Bus Shelter was needed and regularly used by school students and residents alike, and that over the past decade Warrimoo had lost a plethora of infrastructural amenities—such as Public Toilets, bubblers, Bus Stop seating and even plant foliage on the Highway (this was removed when RMS installed concrete barriers, without full compensation). When all had become clear and everyone had stated their case, a compromise was reached and the Bus Shelter was retained. Thank you stakeholders, for your reasonableness, thank you BMCC and Mark Bruhn for your flexibility. After two years lobbying by WCA four new Planter Seats have been installed in front of shops in the ‘Warrimoo CBD’—they each bring a nice touch of green foliage to the public face of our township and the community is accordingly grateful to BMCC, particularly Patricia Lane-Gonzales and Mayor Mark Greenhill, for their ongoing interest in the project. Some of the plants in the Planter boxes have, however, had a tough introduction to our Warrimoo climate and withered. This is our own responsibility, since we—shopkeepers and Warrimoo Citizens alike—had promised Council we would maintain the plants once the boxes were installed. There is no blame attached here! We have experienced a ‘Climate Change’ summer of intense heat which has affected all our gardens and some of our shoppies have had their own preoccupations—like moving out of their premises! Yet it is beholden of us to find a solution/replacement for the dead plants. If anyone has some spare and appropriate plants that might be used instead of those that ‘did not make it’, please come forward and volunteer a contribution. Let Sue or David (in the ‘Blue Shop’) know and we can arrange a ‘replanting’— it would be greatly appreciated by the whole community. Unfortunately funds for the Warrimoo Oval parking overhaul have not been forthcoming and the project has been postponed indefinitely. BMCC has done Summerhayes and will go ahead with the Lapstone make-overs but not ours. 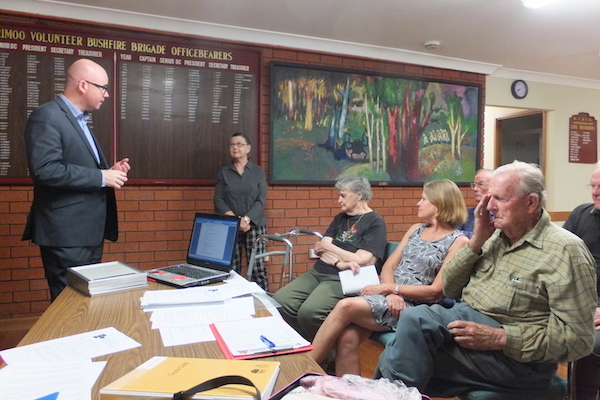 A more detailed report will be given at the next meeting of the Warrimoo Citizens Association. 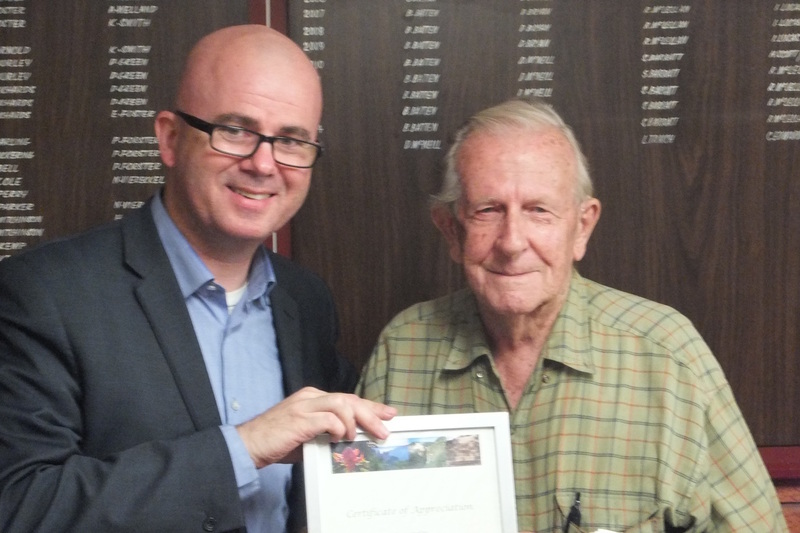 Hardworking, loyal stalwarts of our community were awarded for their service to Warrimoo at a special Meeting of the Warrimoo Citizens Association on February 29th. 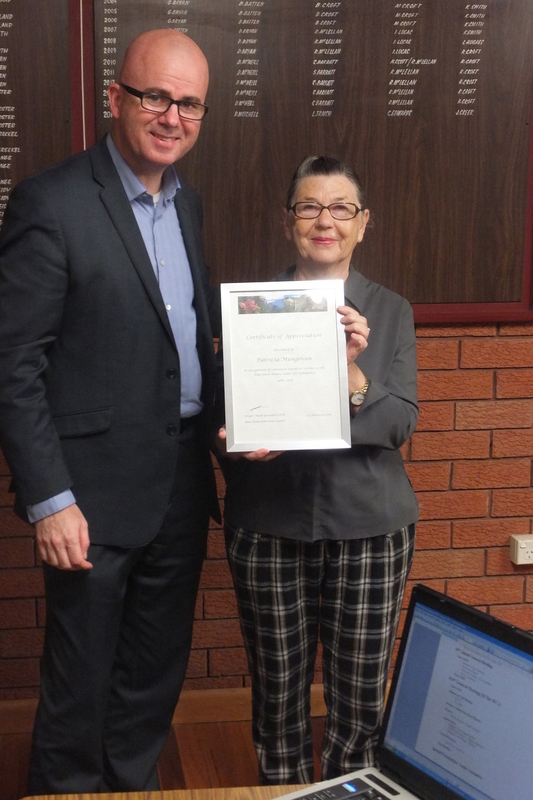 Mayor Mark Greenhill presented Allan Bewley, Lorraine Bewley, Trish Mungovern and Tony Montgomery with specially drawn up Mayoral ‘Certificates of Appreciation’—these were originals, beautifully designed and framed, and well worthy of the recipients’ deep appreciation. Suzanne Brand, Treasurer of the Tennis Court Committee, introduced proceedings with a brief outline history of the Warrimoo Tennis Courts, which opened when Arthur Rickard first set up the Warrimoo Estate in the early 1920’s. They were clay courts situated between the station and the Highway, and they were extensively used during the 20’s and 30’s by locals and visitors alike. Allan receives his award. Earlier in the year he had put down his Tennis Court folder and said–That’s it! I think 47 years is enough! Falling into disuse during the war years, a small but hardy group of players decided to ‘fix up’ the courts in 1952 and resume competition play there. By 1964 the Committee’s minutes spoke of four competitive teams entered in the Blue Mountains competition and a junior club of 31members. 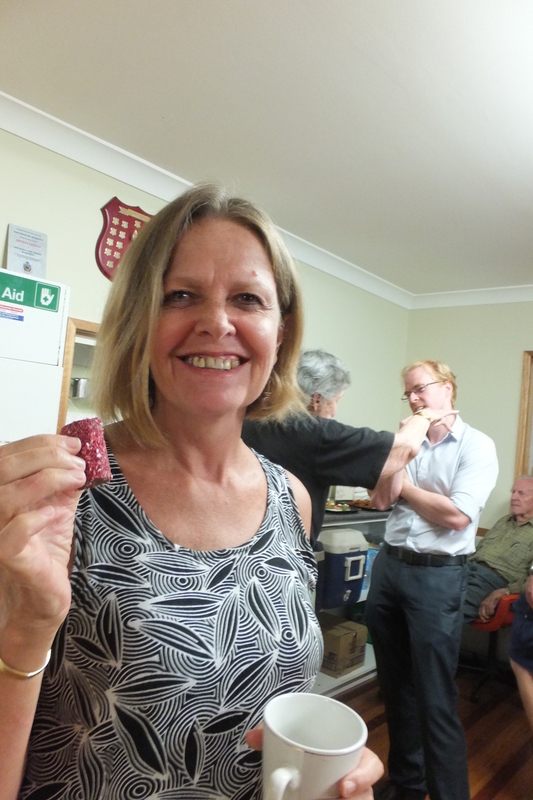 Both the Warrimoo Drama Group and the Fire Brigade shared the old Tennis Clubhouse until they got their own facilities. A thrilled Lorraine Bewley accepts the Mayor’s appreciation. You will never meet a more determined protagonist. By 1967 the Warrimoo Eagles Rugby League club had been formed with its home ground at Warrimoo Oval, and with highway widening on the drawing board, new President Allan Bewley and the executive began campaigning for modernised courts adjacent to the Oval. During this time Lorraine Bewley and Patricia Mungovern attended every Council meeting to drive home the needs of Warrimoo residents and tennis players to any who would listen. The result is the beautiful courts and clubhouse you see today. Suzanne Brand holds up the Certificate awarded to Patricia Mungovern. Not content with continuous service on the 377A Committee overseeing management of the courts, Allan, Lorraine and Patricia also took active and dynamic roles in the management of the Citizens Hall as well as the Warrimoo Citizens Association, in which Tony Montgomery also played a most crucial role. 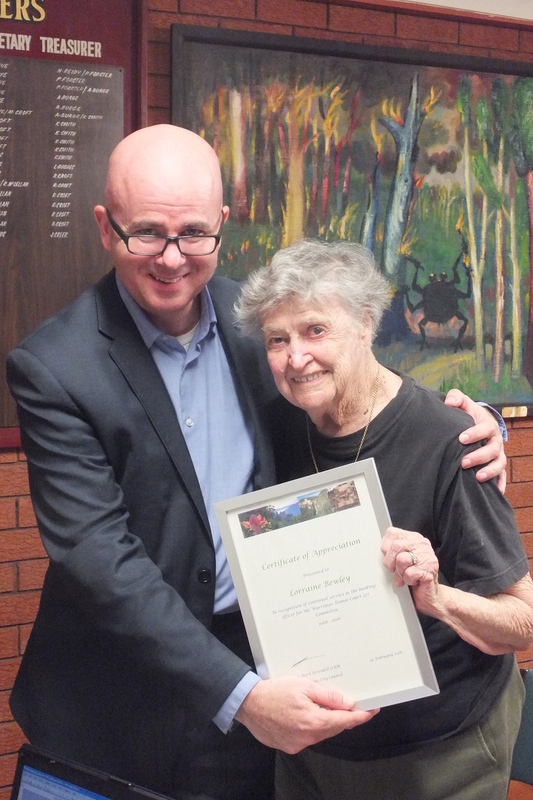 In short, the four awardees have served the people of Warrimoo for nearly 50 years…The small gathering showed their appreciation with generous applause, and then adjourned for delicious canapés and lively discussions with all involved. Congratulations Allan, Lorraine, Patricia and Tony, from all of Warrimoo’s grateful citizens. For earlier news items go to NEWS ARCHIVE.